Tragedy struck in a nursery and primary school in Ogun State on Monday when a suspected mentally-deranged man hacked two kindergarten pupils to death. 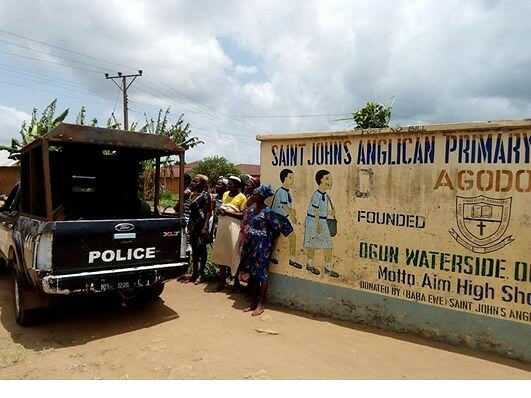 The suspect, Lekan Adebisi, stormed St John’s Anglican Primary School, Agodo, Ogun Waterside LGA and hacked two 4-year-old pupils, Mubarak Kalesowo and Sunday Obituyi, to death as they were on lunch break. According to The Punch, the suspect, who is said to be well known in the community, immediately fled the scene of the incident. The paper quoted the State Police Public Relations Officer, Abimbola Oyeyemi, as confirming the incident, adding that the Area Commander of Ogbere Area Command and the Divisional Police Officers of Ogbere and Agodo Police Divisions were already on the trail of the assailant. He added that, when apprehended, the suspect would be subjected to a psychiatric test to determine his mental state.